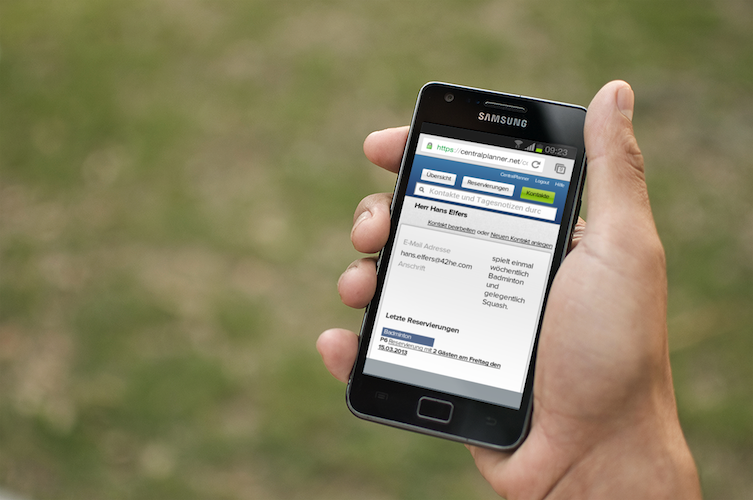 The simple booking system for sports & fitness centers. 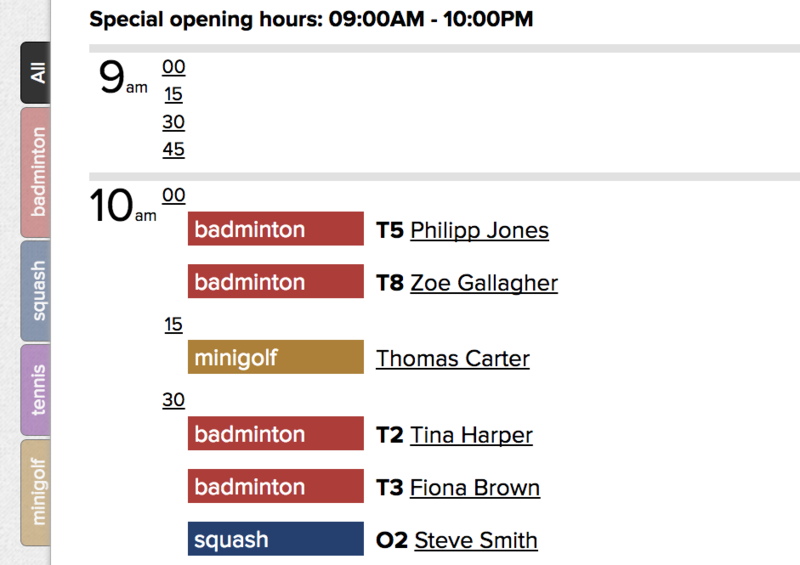 Manage your tennis or squash courts and sports fields with our booking system. You are tired of managing your reservations with handwritten lists and boards? Or you want to give your guests the possibility to book online? With CentralPlanner they can place online reservations anytime and without your help. This feature makes it much easier to manage your sport courts and saves time for you. CentralPlanner helps you to accept reservations quickly and without errors. The reservations system recognizes customers who are already in the system and suggest them to you. You type in the contact information only once which makes work much more convenient.You will acquire a solid customer base, which you can contact and promote easier from now on. You have access to the data of the reservation system from any internet-enabled device: any laptop, smartphone or tablet can be used to enter and view reservations. Satisfy your customers and make your team happier by using a CentralPlanner and try it for free. Manage reservations and build a solid customer base. Each reservation contributes to build an informative the customer history. Use CentralPlanner on Apple or Windows. 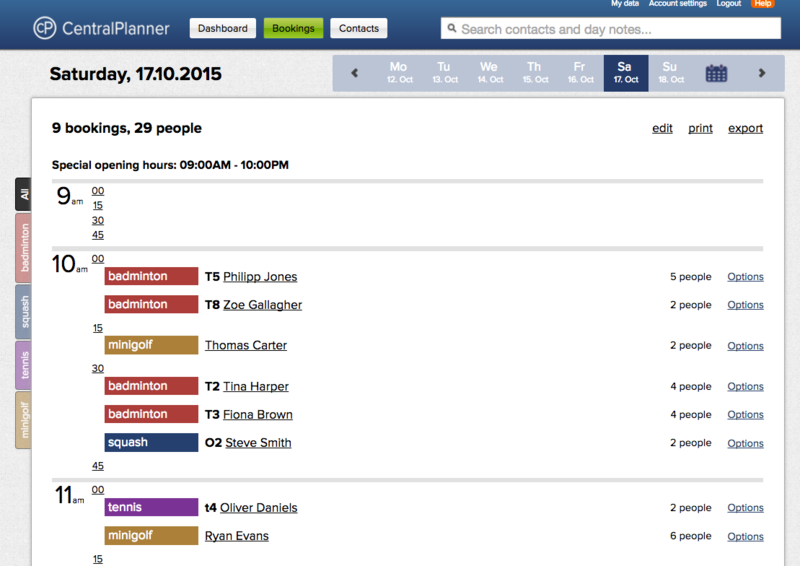 See the CentralPlanner plans & pricing and start your free trial within seconds. With the booking system CentralPlanner reservations can be accepted regardless of time or place. No matter if you are on the pitch with your phone or at your desk — all you need is a smartphone to accept a new reservation for one of your sports fields. Or let your guests book the free courts directly via online booking. Guests can book anytime and do not need to call you. Less calls for you, more flexibility for your guests! See for yourself of more advantages such as the guest management or the management of various sports. A reservations book for longer than just one year: get to know your guests better! With our booking system you collect important data about your guest with every reservation. How often does he play in your sports center? Could he be interested in the club championship in badminton or does he play squash only once in a while? The information will be gathered to all employees so that everyone always knows what the preferences of the guest are — even if they do not know the guest yet. With CentralPlanner every guest becomes a regular customer and thereby a satisfied customer. 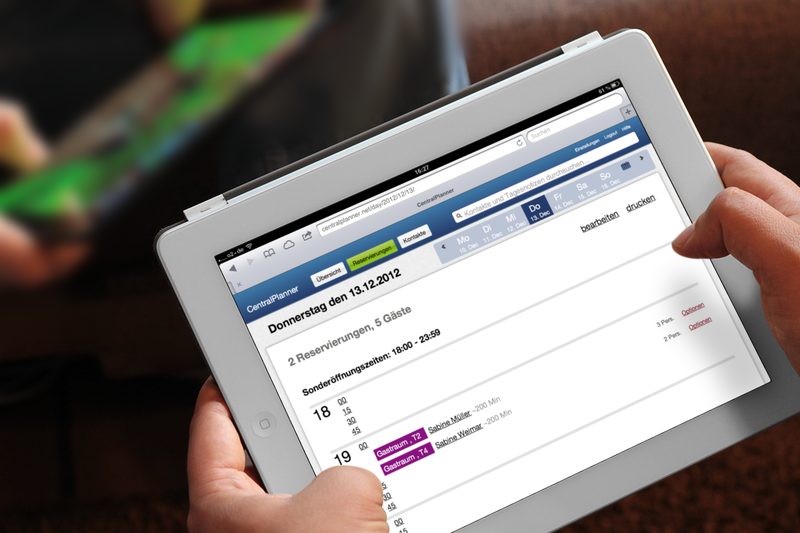 On the homepage of our reservation system, you can already see which days will be very busy or even fully booked. With this feature human resource planning at the sports centers is much easier and you are prepared for a big rush. You can view the latest reservations and keep track of the received online reservations — always and everywhere. Our booking system runs on almost every modern technical devices. No matter if it is a Mac, a PC or a mobile device like an iPad or Android phone. The device has to be connected to the internet and needs a web browser — that’s it! You do not need to install and care about backups. That is what we will do while you care about your customer! The data is protected by multiple layers on our servers in Germany and accessible for you any time. Learn more about the CentralPlanner features or run our 30-day free trial.